The Mamalahou Highway runs through the former sugar cane town of Na’alehu “Volcanic Ashes” on the Big Island of Hawai’i- the southern most-town in the United States. Given its location, it is believed that the Polynesians first arrived in this area around 300 AD to 500 AD. As Na’alehu is on the southern route to Volcano National Park and Hilo Town, I have driven pass this idyllic region numerous times and admired the panoramic vistas and lush vegetation but have never stopped en route. The 2000 census noted a population of 919 residents. The closing of the Ka’u Sugar Plantation in 1951 was a major factor in the decline of the population. The younger generation is seeking educational and employment opportunities in larger cities or on the US ‘mainland’. On March 7th, 14 members of the NAJC Heritage Tour were given a warm lei welcome by Reverend Fujimoto and some elders of the Na’alehu Hongwanji Mission http://www.naalehuhongwanji.org/ The Hongwanji was established on December 9, 1900 under the guidance of it’s first minister, Reverend Yushin Hirokane who provided religious, emotional and moral guidance to the Japanese sugar cane workers. The present Temple and Meeting Hall were dedicated in 1980. Once the centre of religious and social activities, the Buddhist temples – as other religious institutions – are in decline and many have closed. In Toronto the Japanese evangelical church is the only exception as their numbers have grown; all other Nikkei places of worship are faced with the challenge of a dwindling congregation. After introductions, we were given a brief history of the Hongwanji and our group was invited to partake a ‘Groaning Board’ full of fresh fruits, sushi, age and desserts. During the introductions, we were pleased to learn that Mr. Iwao Yonemitsu – a former Sergeant in the famed 442 ‘Go For Broke’ Nisei Combat Regiment http://the442.org/ – was part of the welcoming committee. I admit that I monopolized my time during lunch in ‘talking story’ with him. When I asked Mr. Yonemitsu about specific exploits of the Regiment, he said that his daily focus was always on the survival of his immediate companions and it was not until after the war that he became aware of the Regimental accomplishments. He also down-played the story of the friction between Hawaiian and Mainland Nikkei that was a focus of the 1951 Hollywood movie “Go For Broke” starring Van Johnson. 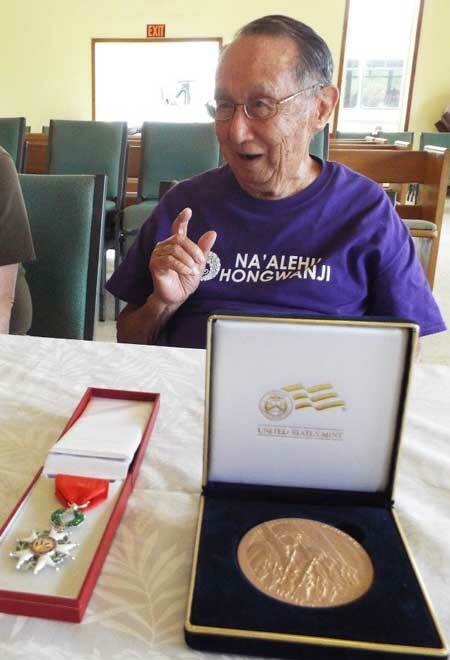 Noting our interest, in the 442nd, a relative of Mr. Yonemitsu brought over the French Legion of Honour and the Congressional Gold Medal that were awarded recently to the surviving members. It was indeed a great honour for us to have met with Mr. Yonemitsu. We are proud of our American and Canadian Nikkei soldiers who were willing to make the ultimate sacrifice to ensure that our communities received full rights of citizenship. We thank the members of the Na’alehu Hongwanji for their hospitality and the warm aloha. In the Town of Hilo, we visited with Arnold and Eloise Hiura who are Executive and Assistant Director respectively at the Hawai’i Japanese Center http://www.hawaiijapanesecenter.com/About-us Established in 2002, the Centre has a wonderful gift shop and a well organized historical exhibition of the Japanese community with appropriate Nikkei artifacts. The aging Nisei population is donating most of their family treasures to the Centre and almost half of the building is taken up with Meiji and contemporary period artifacts. We wish Arnold, Eloise and the HJC Board members well as they begin the process of restoring and cataloguing the collection. During tea, Arnold related an incident that took place with the Japanese cemetery in the town of Pahoa, just south of Hilo. Pahoa lies on the current path of the Kilauea lava flow. In October of last year, it destroyed the small Japanese cemetery except for the grave of Mr. Hiroo Sato (1919-2006). Mr. Sato was a charter member of the Hawai’i Shima Hiroshima kenjin-kai and a member of the Pahoa Nikkeijin-kai. He was a respected local historian and a long-time caretaker of the Pahoa Japanese Cemetery. 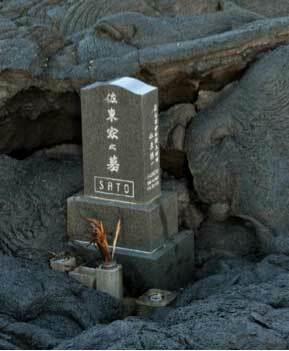 In the Hawai’i Volcano Observatory picture accompanying this article, the lava towers over the back of the Sato family headstone and seems to embrace the grave but does not destroy it and if you look closely, some of the lava from Madame Pele (Fire Goddess) gently touches the top of the headstone as though in blessing. As Arnold told the story, all of us had a ‘chicken skin’ (goose bump) moment. Such incident reminds of natural forces that we will never understand but can respect. On the Island of Oahu, we visited Fort DeRussey Military Museum to view exhibits on the history of the 442nd Nisei Combat Regiment and the career of former US Secretary of Veterans Affairs, General Eric Shinseki of Kauai. We concluded our itinerary to Nikkei institutions by visiting with our friend, Derrick Iwata, the Education Specialist at the Japanese Cultural Center of Hawai’i http://jcch.com/ The current exhibition, “Okage Sama De” gave us the history of the Japanese community in Hawai’i and viewed a video presentation of the Oahu Honouliuli Internment Camp that was recently declared a national monument by President Barrack Obama. The Camp was opened in 1943 to house 320 Japanese community leaders, religious officials and others perceived to be a threat to the security of United States. The opportunity to meet Hawaiian Nikkei is the unique component of the NAJC Heritage Tour. Such visit allows us to connect and share life-experiences of our immigrant ancestors. Such visits create lasting bonds of amity and empathy between the descendants of the ‘watari dori’. Mahalo nui loa to the 2015 tour members – Hana Hou!